January-June 2017: A large number of fake and highly suspicious positive reviews have been submitted for Range Forex. Third party deposit and withdrawal option god. Leverage, speard, commission are normal. Add Skrill, credit and debit card method deposit and withdrawal. And i have taken withdrawal nearly 8000$ IB COMMISSION from the last 1 year itself. Still no issues with them. I recommended to some of my clients also..
Rangeforex good broker service in India. I am a IB and client .my account is live in past 10 month. double the money still i am making profit. Deposit and withdrawal process is good. 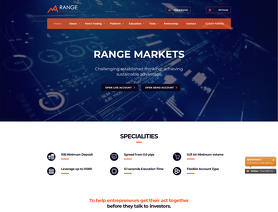 RangeForex is not a broker, its a criminal organization to steal innocent person money. They are giving unrealistic offers for IB but if their client make good profit they are not processing the withdrawal. 200% B book broker. Very worst broker in forex industry. 100% B book. Beware of them. They doing MLM type business. They majorly cheating south indian peoples. World Worst broker. Avoid Range Forex. They are giving eye washing and unrealistic IB offers. But not paying the clients if they make good profits. 100% B book broker.